As Rhona Berenstein discusses in Lesbian Histories and Cultures, mainstream film representation of female desire was often alluded to or implied rather than shown, and when desire was made explicit it had a tendency to end in death (or falcons). The lack of which is what makes Carol, the latest film from Todd Haynes, such a delight. 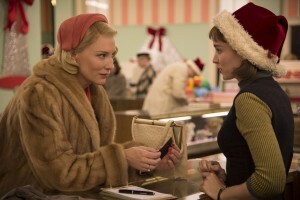 The film centers on the growing relationship between Carol, an older woman going through a divorce, and Therese, a young woman working in a department store. The film takes place in version of 1950s era New York that’s reminiscent of the Edward Hopper painting, “Nighthawks.” The painting portrays three customers and a diner worker in a diner late at night. The diner is positioned on a street corner, and is almost entirely made of glass. The people inside are separated from us the viewer, on display for us and for those walking by. The film begins with a slow tilt up from a street grate to the hustle and bustle of characters on the street. Therese is often seen reflected in, or peering through the glass windows of cars and trains, separated from the audience and from the other people. Indeed, the story is mostly told in a sort of extended flashback, brought about as Therese gazes out of a rain streaked cab window. Initially, Therese has a boyfriend, Richard, who bikes her to work, while pitching marriage and a trip to France. But Therese demurs; she seems more interested in the limited toy train set on the department store floor than she is with Richard. When Carol later asks her if she wants to marry Richard, Therese responds, “I barely even know what to order for lunch.” Similarly, Therese wants to be a photographer but she’s reluctant to photograph people, preferring to stick to things that don’t stare back. It’s only after Carol picks her up and takes her to New Jersey that Therese gets out of the car, standing by the car to take photos of Carol. As the movie unfolds, we watch Therese and Carol watch each other. Perhaps it is the sight of Therese, who Carol spots from the back of a cab on her way to the final appointment with Harge and the lawyers that inspires Carol to act in her own self-interest and not capitulate to Harge’s demands. She twists and turns in the back of the cab to watch Therese for as long as possible, unable to see or reach her through the glass box of the car’s windows. It is fitting then that the movie ends, not as it began, on the anomic city streets, but inside a warm, dark-paneled restaurant, the exact opposite of the glass-walled Nighthawks. Carol and Therese have found each other again, and the room around them pulsates with laughter, music, and possibility. Todd Haynes’ new film, Carol (2015) and the Coen Brothers’ recent Inside Llewyn Davis (2013) have the same structure. In the latter, an angry man confronting Llewyn (Oscar Isaac) in a Greenwich Village nightclub bookends the film’s story about a failed journey to fame and fortune from New York City to Chicago. In Haynes’ film, a male friend encountering Therese (Rooney Mara) in a restaurant frames the tale of an aborted flight from New York City to Waterloo (Iowa’s, not Napoleon’s). However, while the Coens construct a protagonist crippled by indecision and self-destructiveness, Haynes’ film celebrates the human potential for love despite horrifyingly restrictive social conventions, in this case, of 1950s American taboos against lesbian desire. While relating his moving love story of Therese and Carol (Cate Blanchett), Haynes swirls a remarkable understanding of film history. In the film’s opening image, over which the credits are presented, the camera lingers on an intricate pattern of metal stands. While the structure turns out to be a drainage grate in the gutter of a city street, the pattern invokes Citizen Kane (Orson Welles, 1941), whose opening image features a tilt down a chain-link fence which traps Charles Foster Kane in his failed pleasure-dome, Xanadu. Citizen Kane is the greatest bildungsroman of the cinema, tracking the rise of a young boy born poor in a shack into a newspaper mogul modeled on William Randolph Hearst. Citizen Kane’s modernism is devoted to gloating over the fall of a powerful man. Indeed, modernism is obsessed with this negativist project, lamenting the devastation modernity wreaks on its hapless human victims. Carol engages such modernism only to overwrite it with a loving embrace of melodrama. In the film’s opening scene, the camera approaches Therese from behind, framing only the back of her head. This invokes another of Haynes’ favorite filmmakers, Jean Luc-Godard, whose Vivre Sa Vie (1962) begins in a diner and rests for minutes only on the backs of the lovers’ heads. Whereas Godard uses the alternative style to ironize the cinema’s typical embrace of romance, Haynes redeems the medium. His frontal close-ups on Therese’s face afterwards refuse to disdain the possibility of cinematic love. Carol is a bildungsroman of an entirely different order. When we first meet young Therese, she is standing at the counter of a downtown department store, surrounded by toys, particularly dolls and trains. In the case of both objects, Haynes invokes film history in order to forward his story of Therese’s productive coming of age. The toy trains beloved by the child-like young woman are best represented in Charles and Ray Eames’ film, Toccata for Toy Trains (1957), a celebration of the craft of sculpting wood and metal into objects that keep adults connected to the joys of childhood. Similarly, the dolls which litter the department store shelves, and hence the film’s frames, invoke Haynes’ infamous first film, Superstar: The Karen Carpenter Story (1988) in which he tells the story of the 1970s singer’s death from anorexia nervosa by gradually melting Barbie dolls and filming them. Whereas Superstar laments the social destruction of a talented woman, Carol celebrates her development into a mature, caring human being. This conceit is most effectively carried through in Haynes’ loving reconstruction of All That Heaven Allows (Douglas Sirk, 1956), a sumptuous classical Hollywood melodrama also of central importance to Haynes’ earlier paean to the 1950s, Far From Heaven (2002). In Sirk’s film, a middle-aged widow, Cary (Jane Wyman) falls in love with her younger gardener, Ron (Rock Hudson). The full social force of her small New England town forces her to break off the love affair, deeming the class- and age-differences as far too scandalous. Near the end of the film, Cary, alone and abandoned by her adult children, shops for a Christmas tree at a stand on the town square. She runs into Ron, who is helping his friend unload the trees from his farm. Cary and Ron have a touching encounter until a young blonde shows up. Cary misreads their relationship, thinking Ron has taken up with the young girl far too soon after their break-up. Haynes re-works Sirk’s Christmas tree scene, placing it much earlier in the film. As they are first falling in love, Carol drives Therese out of the city to her home in the country. They stop at a Christmas tree stand. Carol exits to purchase a tree for her family, while Therese remains in the car. A photographer, Therese takes out her camera and snaps a shot of Carol with the tree. While the scene does not build the emotional tension it has in Sirk’s film, it introduces Haynes’ intervention into the material. While simultaneously taking on the function of Ron, as Carol’s younger lover, Therese also adopts the stance of Sirk himself. Therese films the scene of Carol at the tree stand, as Sirk did of Cary at hers. This introduction of the artist into the diegesis allows Haynes’ film to chart a completely different course. All That Heaven Allows ends with love held in stasis. Within the “too-late” logic of the melodrama, just as Cary decides to damn social conventions and return to Ron, her true love, he is out walking around his bucolic property to clear his mind. Cary knocks at the door of his farmhouse, but he is, of course, not at home. As Cary gets back into her car and drives away, Ron spies her from atop a cliff. He hollers for her, but she cannot hear him. Distracted, Ron slips off of the cliff. Sirk’s film ends with Ron convalescing in bed, with Cary dutifully sitting vigil by his side. Whether they will be happy again, and how they will deal with the brutal social regime that surrounds them, are dogging questions that the film leaves unanswered as it ends in limbo. Haynes leaves no such ambiguity about the power of love. Carol initially gives up her relationship with Therese in a futile effort to keep her husband from taking her daughter, Rindy away from her. However, Carol eventually realizes the futility of sacrificing happiness for social convention. In her lawyer’s office, Carol abandons her custody bid, channeling the famous ending of Henrik Ibsen’s A Doll House (1879). Nora tells her husband, Torvald that she is abandoning him and their children so that she may find out what she could become in the world outside. The play ends with her slamming the door in Torvald’s face. There is no such need for Carol to slam the door in the lawyer’s office; she simply states, “What use am I to [Rindy] if I’m living against my own grain?” Unlike Ron and Cary, Carol and Therese are not too late to find happiness and stability, despite their 1950s milieu. It is art that engineers this difference. Therese captures Carol in various photographs, the most important of which is the one at the Christmas tree stand. The film returns to this image repeatedly. What Ron and Cary were not able to do, and Sirk was unwilling to do, the artist Therese, in control of her own story, can. When Carol writes Therese a letter apologizing for her retreat into conventionality, Therese has the ability to take action and return to her beloved. No slippery cliffs or German filmmakers can delay this journey into adult happiness. Haynes-as-Danny’s intervention allows Therese to grow beyond her infantilized role at the department store, forced to wear a silly Santa hat while selling toys. He initially takes an interest in Thereses for romantic reasons; Danny tries to kiss her early in the film, only to be rebuffed. However, this rejection does not keep him from continuing to offer her a job at the newspaper, an opportunity she finally accepts. Danny is the most interesting character in the film. We first meet him in the projection booth at a movie theatre where Therese and her friends are watching Sunset Boulevard (Billy Wilder, 1950), another modernist film pessimistic about love. Danny is taking notes—“I’m tracking the correlation between what the characters say and what they feel”—gleefully embracing the critic’s role. Haynes film focuses our ability—critics and filmmakers alike—to celebrate the human ability to overcome social repression and find the relationships that make the world bearable. In Carol, Haynes has produced a masterpiece of the melodramatic imagination.